The Tundra, aka. five.seven, will be the new iG Support vehicle for 2011. It has replaced the FZJ80 Land Cruiser that will now see a minor off-road build. The plan for the Tundra is to leave it as stock as necessary. A phrase we have begun to appreciate more and more over the years. It is NOT a dedicated off-road vehicle.. it is our ‘duty truck’ or ‘work horse’. Something that can haul, tow, rescue and pickup dinner. A difficult, but achievable build that should prove years of reliability and performance. 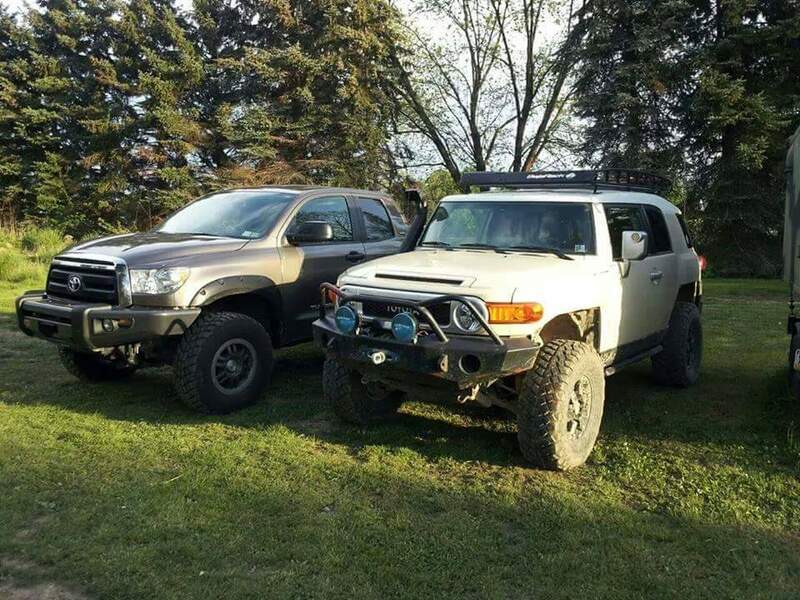 The immediate plan was to acquire the individual accessories from Toyota / TRD that were deemed “worthwhile”. These include small items such as a TRD air filter & TRD intake flow accelerator, interior under-seat storage, OE all-weather floor mats and some miscellaneous bits. With the smaller bits sorted we moved onto the suspension upgrades. I feel that other than the driver the suspension, wheel and tire is the best place to start most projects. Old Man Emu suspension has time and time over delivered a top quality, long lasting product for my 4×4 vehicles. OME 614 front coil springs have been selected for weight handling characteristics that will permit a medium to large size bumper or bar without sagging of the coil spring, loosing lift and causing premature wear to other components. Nitrocharger struts and shocks will fitted and to complete the build a pair of OME Dakar rear leaf springs. Keeping the theme – an ARB Sahara bar has been selected to protect the front of the truck. I have opted for the Sahara Bar over the full bull bar to save weight. I also prefer the aesthetics of the Sahara design (minus the center hoop). ARB Fog lights are fitted and wired into the OE wiring for simple operation with a clean factory look. To provide better paint protection, Bushwacker Pocket Style Fender Flares have been installed. The fasteners were left off as I didn’t want shiny bits on the truck. Besides looking cool, the Bushwacker flares provide an additional 2″ of tire coverage. Perfect for what’s was chosen next.. 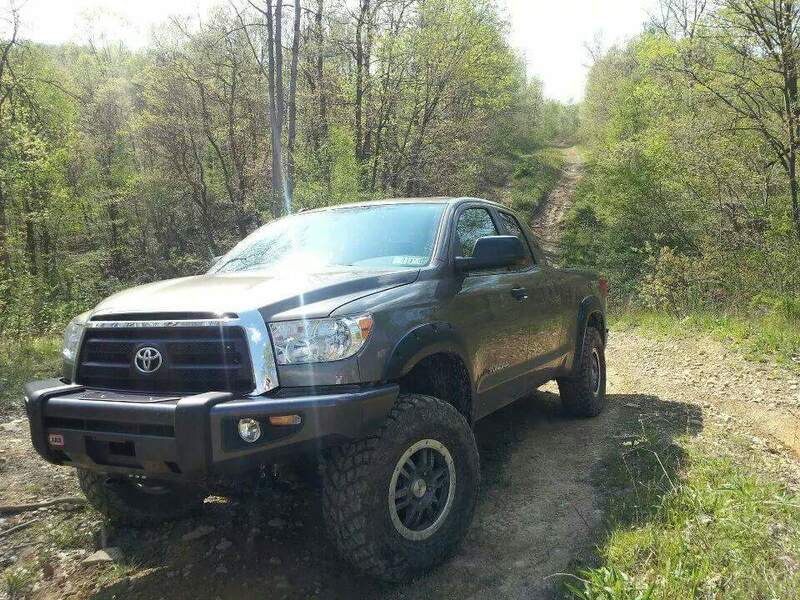 The TRD Off-Road Package (ORP) wheels were swapped for TRD Rock Warrior (17×8) wheels. Wrapped in YOKOHAMA Geolandar M/T+ tires. The YH M/T+ is a true “road going” Mud Terrain with fantastic on road and off-road manners. The perfect tire for nearly all conditions. …And since 381 hp and 401 lb./ft. of torque is never enough.. A TRD Supercharger will be fitted at a later date. 505 hp and 550 lb./ft of torque is too hard to pass up in a factory, (read: warrantied), truck. I suppose it will make towing easier too.. 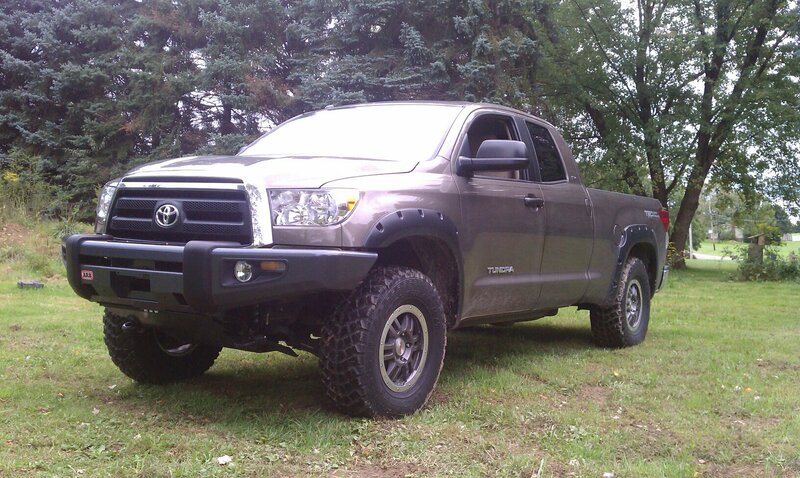 Currently awaiting the OME rear suspension components the Tundra looks like this as of 9-15-11.. The truck sits perfectly level however I want to add a bit of rake back into the setup as it came stock this way. And to increase towing / hauling capacity.